I’ve never worn an ankle bracelet like the one Lindsay Lohan had to wear while under house arrest. But after two days testing the Microsoft Band, I think I may have an idea of how constricting and confining those electronic monitors might be. The Microsoft Band is uncomfortable to wear, and its heart-rate tracking, a marquee feature, doesn’t hold up to real-world testing. 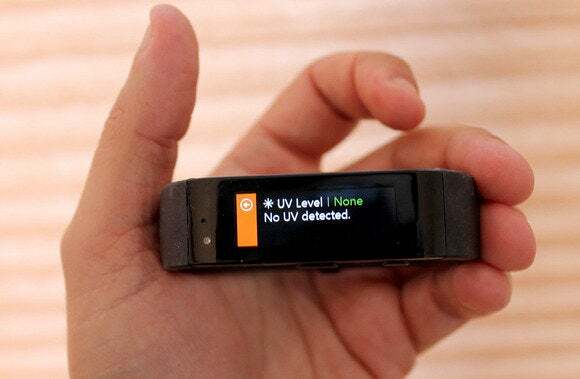 It’s a shame my first impressions are so negative, because with built-in GPS, a UV sensor, skin temperature and perspiration sensors, and a broad set of smartwatch-style notifications, the Microsoft Band promises a lot of cool features for $200. Friends will see the beautiful display—if you wear the band on the outside of your wrist, like a watch. Where the best wrist wearables are pliable and unobtrusive, the Microsoft Band is bulky and rigid, and never lets you forget you have it on. Sure, it’s physically large relative to competing fitness bands like the Jawbone UP24, Runtastic Orbit, and Samsung Gear Fit. But the bigger problem is its broad, inflexible display face. 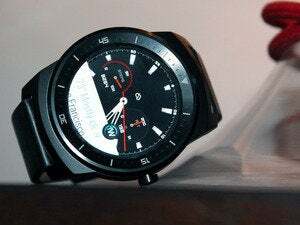 Factoring in the bezel around the display, it measures more than two inches long. It’s also straight as a board. A more comfortable chassis would follow the gentle curves of human anatomy. The upshot is the Microsoft Band never melts away into the background like a proper wearable. During testing, I always felt that something was on my wrist, especially when I banged the band on table tops, or got it caught on shirtsleeves. It’s omnipresent in the worst way possible. 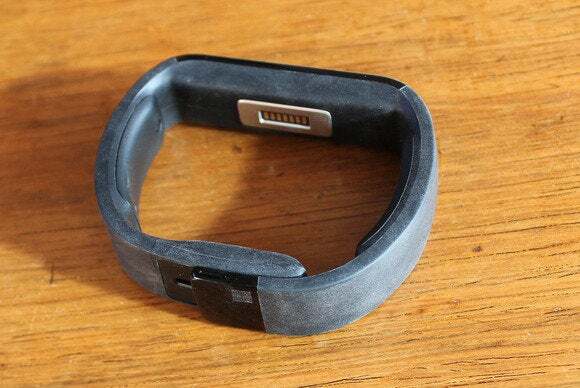 There's nothing beautiful about the Microsoft Band clasp, which is what the world will see if you position the display on the underside of your wrist. The Microsoft Band is unique in that you can wear it on either wrist—all other wearables are designed for your non-dominant wrist. It can also be worn on the inside of your wrist. These options are nice, but I never found a comfortable position. In fact, the band felt most awkward—sort of like a handcuff—when I wore it on the inside of my dominant wrist. Every flex of my forearm reminded me that I was shackled to Microsoft’s ambitious new Health platform. This position also hides the Microsoft Band’s attractive 320x106 display, and instead shows the world its unglamorous clasping mechanism. Just look at the photo above. It looks like something designed by Raytheon, not a company interested in aesthetics. Spectroscopic heart-rate sensors have become de rigueur in the latest crop of wrist wearables. The Samsung Gear Fit and all the Android Wear watches include these sensors, but don’t make bold claims about their accuracy. In fact, those devices only promise what we’ll call heart-rate “spot checks.” They’re not accurate enough to report continuously updating heart-rate numbers during the heat of exercise, and to get a single-moment-in-time heart-rate reading, you have to remain perfectly still. But Microsoft says its Band does more than that. It promises its sensor can track heart rate during workouts (an essential component of zone training), and compares its system to chest strap monitors, the gold standard for consumer-grade heart-rate monitoring. 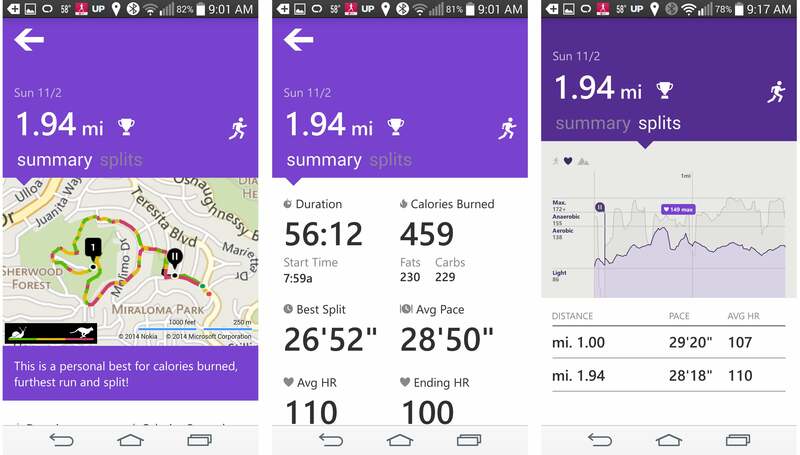 Well, I ran a couple of real-world tests, and found the Microsoft Band falls short of its claims, at least in one familiar workout scenario. 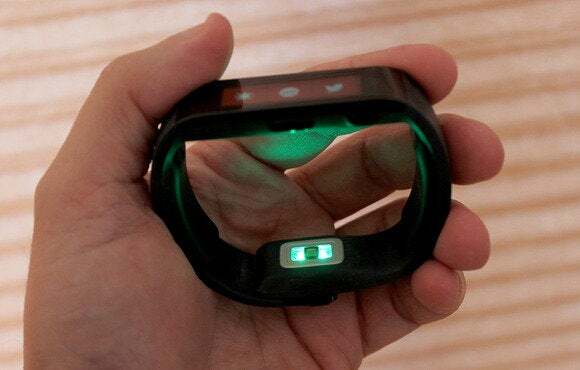 The band's sensor LEDs are quite large, and that should help improve the spectroscopic heart-rate tracking. Still, it seems Microsoft still has work left to do. My control device was LG’s Heart Rate Earphones, which I’ve tested against a chest strap monitor from Adidas. My testing indicates the Heart Rate Earphones match the Adidas chest strap monitor heartbeat for heartbeat, and I’m confident in the Earphones' overall accuracy—especially their ability to respond to rapidly increasing or decreasing heart rates. When I speed up and slow down, the Earphones’ heart rate numbers speed up and slow down accordingly. So, for my first test, I put the Microsoft Band on my wrist, and the Heart Rate Earphones on my ears, and headed out for a one-hour hike up and down Mount Davidson. Right from the beginning of the trek, the Microsoft Band reported much lower beats-per-minute: 25 bpm less than the Earphones as I walked outside my front door. A general pattern of laughably low heart-rate numbers continued throughout the hike. A 74 bpm deficit? Seriously? About 10 minutes in, the Band was reporting 21 bpm less than the Earphones. A few minutes later, the Band spiked to 4 bpm more than the Earphones. A 4 bpm variance is acceptable for a consumer-grade product, but a few minutes after that, just as I was really breaking a sweat up a steep part of the mountain, the Band fell behind the Earphones by a whopping 48 bpm. A few minutes later, I thought the Band had somehow calibrated itself, as it reported just 2 bpm more than the Earphones as I neared the top of mountain. But when I finally hit the summit—at the peak of my workout and short of breath—the Band was a ludicrous 74 bpm behind the Earphones. 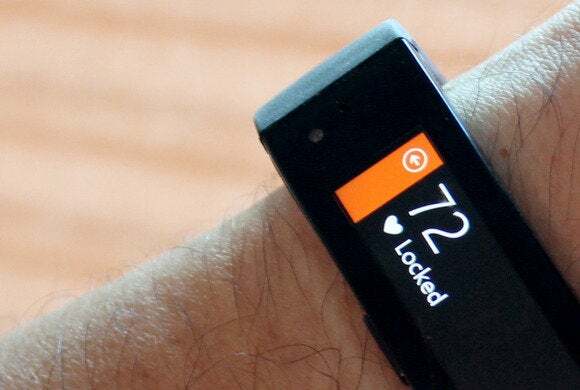 The Microsoft Band's heart rate reports wouldn't be so troubling if the band didn't blurt out, "Hey, I'm locked and loaded, and ready for accuracy!" Figuratively speaking, of course. Over the course of the hour, the Microsoft Band consistently reported heart-rate numbers that lagged far behind those of the Earphones. Worse yet, its reports fluctuated wildly, showing rapid BPM swings that didn’t jibe with reality. One moment, my two devices showed similar numbers. The next moment, the Band would show a 20-, 30- or 40-odd bpm deficit. The Microsoft Band’s performance disturbed me, so I tried a similar A/B comparison test on my elliptical machine at home. Keeping my wrists as stationary as possible, the Microsoft Band yielded far more accurate (and reasonable) results. Its heart rate numbers were always within a few bpm of the Earphones, and tracked evenly as I increased my heart rate from 85 bpm to 140 bpm throughout a workout. Of course, there's no UV light inside, but I tested the feature outside, and it reported as promised. On the plus side, the Microsoft Band reported steps counts that were within about 5 percent of two other wristbands I was wearing during the hike. Heart-rate tracking is fundamental to so many of the Microsoft Band’s fitness features, so it’s rather heart-breaking that I don’t trust the platform’s numbers. For our final review, I’ll spend more time with the band’s heart-rate tracking, and, who knows, maybe my experience on Mount Davidson will prove anomalous. I’ll also spend more time with the band’s deep well of features. 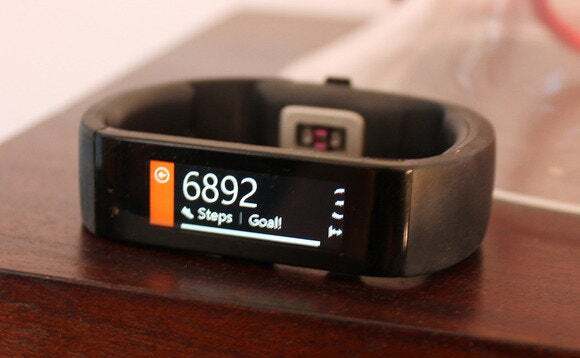 But for now I can tell you the Microsoft Band’s interface is easy to navigate, and does a wonderful job of translating the aesthetics of Microsoft’s tile scheme to a wearable interface. The UI’s look-and-feel is unmistakably modern Microsoft, right down to its colors, fonts, and background motifs. Unfortunately, there’s no option to set the exceedingly oblong display to a vertical orientation. This is an oversight that Microsoft needs to address in an update—Samsung did so with the Gear Fit, and improved its user experience immensely. I really dig Microsoft's workout charts. On the left we see my route up and down Mount Davidson, with exertion levels flagged by color. Nonetheless, the display is easy to read in sunlight, and I easily got more than a day’s use on a single charge (Microsoft claims 48 hours' battery life unless you amp up brightness and hit the GPS a lot). Speaking of which, I really appreciate the onboard GPS: I wish all activity trackers used GPS to map workout routes, and report exertion levels and pace against those routes. I also liked being able to read text messages, email snippets, and weather reports right from band’s display. I paired the Microsoft Band with an Android phone, so I currently don’t have any opinions on Microsoft’s Cortana voice-control integration. I’ve only been using the Microsoft Band for two days, but so far I see an incredibly ambitious product that feels like an unfinished project. But let’s give this wearable a bit more time to percolate. It’s always possible I’ll get used to the band’s fitment, and its initial heart-rate performance will turn out to be an unfortunate fluke.